Don't miss the opportunity to own this fully remodeled and extraordinary water-front home with a brand new 40 ft. Dock! Welcome to admiralty island! This contemporary design provides an amazing backdrop of huntington harbour with stunning views from almost every room! Dramatic high ceilings, abundant natural light & gorgeous upgraded flooring invite you into the perfect entertainers home. The flexible floorplan flows seamlessly to expand your living area to two outdoor spaces for the ultimate southern california indoor/outdoor living. For a private outdoor setting, gather on the first of two patios to enjoy the cozy outdoor fireplace and large grassy area with enough space to add a pool or enjoy the water views on your sweeping second water front patio. You will delight hosting your friends in your ultimate chef’s dream kitchen with viking stainless steel appliances, granite counters, custom wood cabinetry & wood-top bar. Upstairs your luxurious master bedroom showcases tremendous floor to ceiling windows and two capacious balconies for basking in the serene water views. Immerse yourself in your resort style master bathroom with its soaking tub, dual vanity, & oversized walk-in glass shower with stone accents. This is the life! Harbor views, your minutes from the beach, shopping & dining; every part of owning this home will amaze you! Don’t miss out on the opportunity to finally have everything your heart desires! 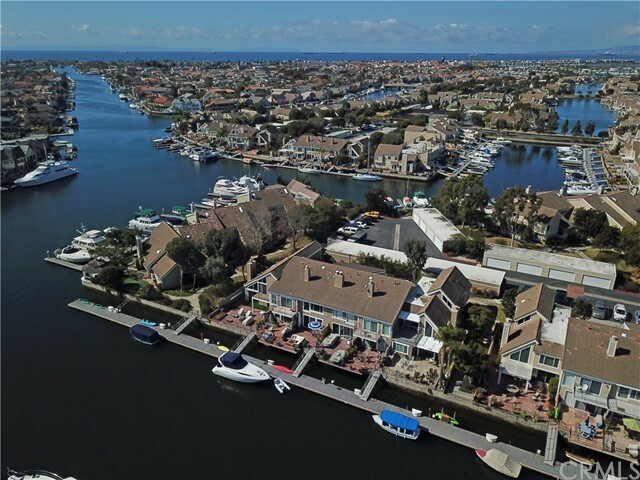 Come join the huntington harbour lifestyle in this waterfront single family home on humboldt island with over-the-water sunset views & boat dock! Take your boat out fishing in the morning, then come back and do some paddle-boarding in the afternoon. Finally take family & friends out for a harbour cruise or enjoy an evening of entertainment at the yacht club, capt jack's, or peter's landing. This home has a quiet interior tract location with two bedrooms 1. 5 baths on the bottom floor, family room, remodeled kitchen, raised casual dining area, formal dining room, laundry room, and spacious living room with bar & fireplace looking out at the water & sunset. Upstairs is the master bedroom with luxury waterview bathroom, additional bedroom & full bath, plus a light & bright waterview loft area. The spacious waterfront wood deck is perfect for lounging, and the concrete patio has a firepit and bbq. Ideal for entertaining on summer weekends! Friends will appreciate the invitation to your boat parade parties. The dock is approximately 35 feet with very little wind/current, savvy skippers will love the dock as soon as they see it. Yes, this home has all you need, and if you are going to purchase a home on the water, this is the orientation you want. Do not miss it! Water view! Understated elegance and tranquility abound from this harbour sanctuary. Re-built in 2011, the modern design and open concept floor plan offer a cohesive and welcoming home. The floor to ceiling windows and eight foot fleetwood sliding doors illuminate the home with natural light and blur the line between indoor and outdoor spaces. 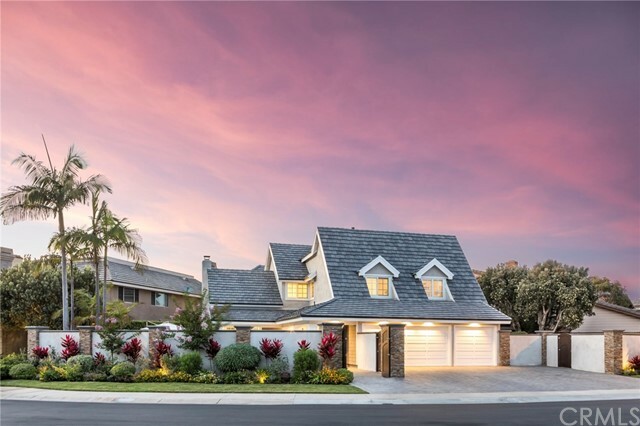 Situated off the zen garden and drought conscious backyard, the main floor master showcases a gorgeous en suite making this house a quiet and relaxing respite fully functional as a single story. The gourmet kitchen features modern design with pops of color and rich textures to compliment the look. Ample cabinetry, an eat-at island and upgraded appliances from bosch, ge monogram and subzero make hosting and preparing meals a joy. Upstairs boasts a large second-story bedroom and sunroom feature with full-width balcony and a view of weatherly bay’s huntington harbour marina. This home is ideally located on a quiet, single loaded street affording privacy, limited traffic and ample on-the-street parking. 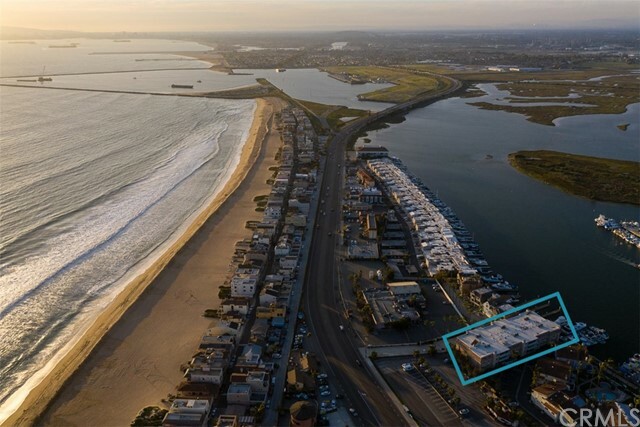 Within close proximity to nearby shops, restaurants, harbour view elementary school, the bolsa chica wetlands and easy access to the harbour for boating and water enthusiasts. With east/west exposure, cool breezes and sunset views give this home an even greater appeal. 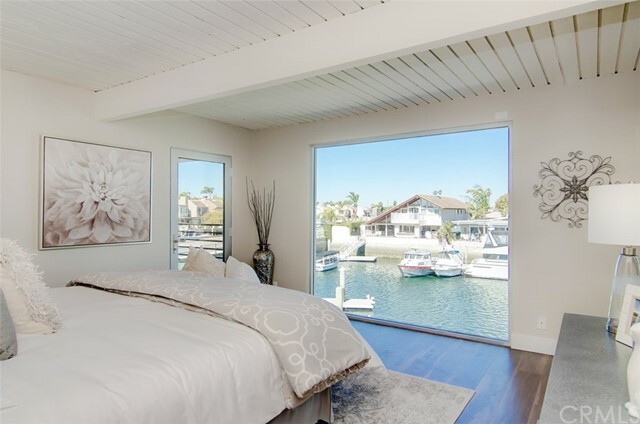 This chic home on the water will take your breath away with ocean lagoon views from the master bedroom, kitchen, dining, family room & back patio. Your own boat slip is just a minute’s walk, measuring 17' wide by 35' but can hold up to 40’. relax with some hot cocoa and loved ones in front of the family room glass crystal fireplace under 2-story wood-beamed ceilings over 20 feet high. Bedroom & full bathroom downstairs. Offering a chef’s delight kitchen with 5-burner gas range, quartz counters, & custom solid maple wood soft-close cabinets, drawers, and pull-outs. The home’s open floorplan great room and ultra-durable real-look wood laminate makes this home perfect for entertaining. Wake up to serene water views from your spacious master bedroom with walk-in closet and balcony. Grow the herb garden you’ve always wanted in your private patio off the breakfast nook. Stay green with low-flow toilets and tankless water heater. Enjoy the home’s quiet end-unit location on a premium spacious corner lot. The hoa fee covers your water, sewer & trash! The community of seagate provides “seagate yacht club”, 2 clubhouses, 2 community pools with lap lanes, spa, playground & 6 tennis courts. This is a rare opportunity to own a waterfront home at this price! Welcome to huntington harbours most stunning coastal chic, warm contemporary townhome. 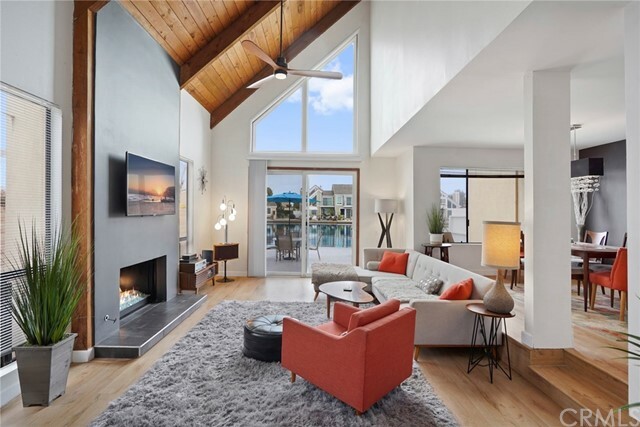 Completely updated with the newest in modern design features, this waterfront townhome in huntington harbors original sea gate community offers the very best in amenities and style. The home offers relaxing views of the channel and a 40’ boat dock, right outside the back door. 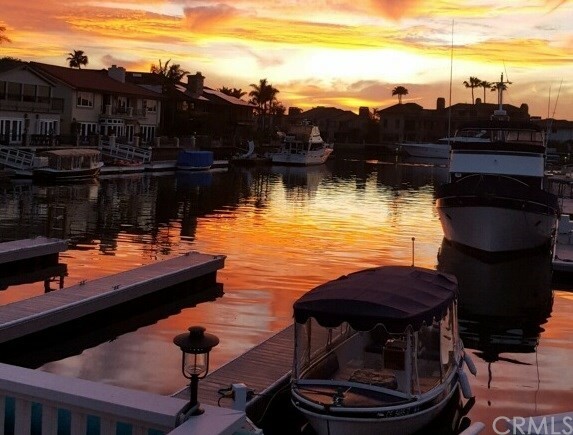 Relax and unwind on the waterfront patio while gazing at the water's reflection and magical sunsets. Take your paddle boards for a tour of the inlet from this location. Downstairs, this gorgeous home features an enormous gourmet kitchen with quartz countertops, beautiful sea glass backsplash, stainless appliances, large walk-in pantry, abundant white shaker cabinets and an eat-in breakfast bar. There’s a multi-purpose den off the kitchen, powder room, a formal dining area leading to a cozy step down living room with a fireplace, opening out to the back patio, letting the sweet scent of the ocean water air breeze through. Upstairs offers two bedrooms with mirrored wardrobes, a guest bath/laundry room and a large master with en suite, large dual mirrored closets with amazing water views. An accessible, very large finished attic. This quiet, light and airy home in the harbor is the perfect place to call home and enjoy the best the city has to offer. 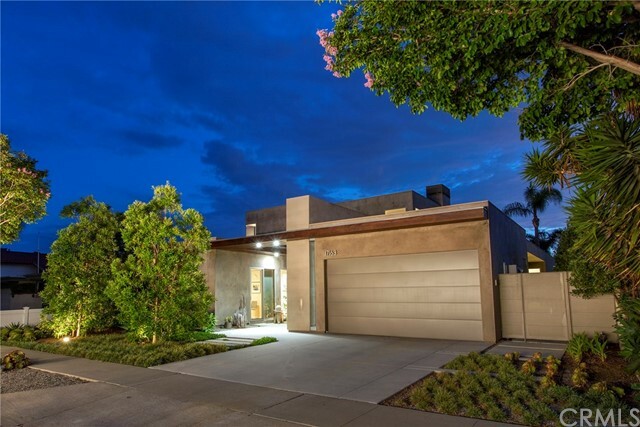 Walking distance to shops & restaurants & is located near excellent hb schools. 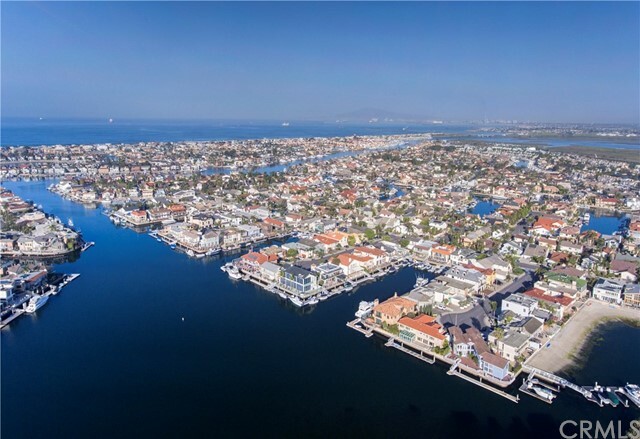 Affordable coastal living with the very best southern california has to offer overlooking the marina and just a short walk across pch to the beautiful sandy beaches of sunset beach. This exclusive gated community offers amenities including a tennis court and a marina front pool, spa and club house. 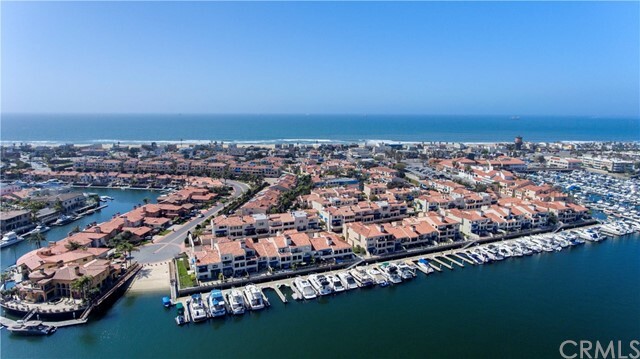 The condominium offers the opportunity to design your dream home with all that sunset beach, peter's landing, and huntington harbor have to offer just outside your doorstep. With a large spacious floor plan, this home has two bedrooms and four bathrooms, and a large den with a wet bar and full bathroom that could easily be converted into a third bedroom. The large balcony with marina views can be accessed from the living/dining area and den from three different sliding glass doorways offering lots of natural light throughout. Peter's landing is just next door and is currently under redevelopment and will offer premier restaurant/retail/office space with pubic walkways, park like seating areas, and new restaurants and shops. This home has so much potential for the right person who can draw inspiration from the surrounding area in redesigning this home into the perfect coastal dream home.